Remember the time Bobby Boucher showed up at halftime and helped the SCLSU (South Central Louisiana State University) Mud Dogs win the Bourbon Bowl? The year was 1998. SCLSU was down 17-0 at the half. An underdog story like no other, Bobby Boucher, aka “The Waterboy,” put his sideline days aside and went from loveable fool to savior. Boucher threw the game-winning TD pass as the clock ran down to zero, wining the Bourbon Bowl, 30-27 and became the Mud Dogs’ star and season MVP. Years later, ‘The Waterboy’ is remembered as a classic “must-see” sports movie that transcends generations. To celebrate the 20th anniversary of the film’s original release and the legendary Mud Dogs’ victory, adidas has fused sport and culture through a creative collaboration with Disney to introduce the limited edition adidas SCLSU and The Waterboy 20th anniversary capsule collection, featuring the adidas Bobby Boucher Mud Dogs’ replica jersey. The adidas Bobby Boucher Mud Dogs’ replica jersey recreates the original adidas Mud Dogs’ uniforms worn in the film. 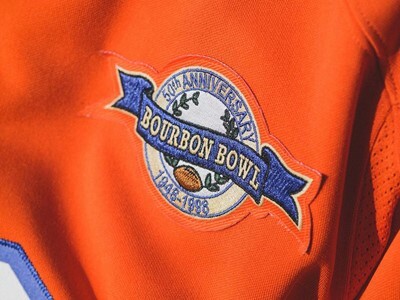 Centered around the classic orange home colorway, the jersey features Boucher’s name on the back, the #9 and the Bourbon Bowl Championship patch on the upper left chest. Additional design details include the royal blue and white striping across the sleeves and neckline. Rounding out this limited edition capsule collection, key pieces of apparel and accessories seen throughout the 1998 classic film have been recreated for fans of Bobby Boucher and the Mud Dogs, including the Bobby Boucher Mud Dogs’ replica jersey ($120), Coach Klein’s varsity jacket ($100), an SCLSU hat ($30) and SCLSU water bottles ($20). As an additional nod to the 20th anniversary, adidas will bring the classic movie back to its roots and present authentic adidas SCLSU and ‘The Waterboy’ 20th anniversary uniforms to University Lab High School (ULAB) football team in Baton Rouge, Louisiana. To complete the head-to-toe look from the movie, adidas partnered with Riddell to blend the past with the present by combining the state-of-the-art head protection in the new Riddell Speed and SpeedFlex helmets with the classic look of the Mud Dogs logo, premium decal striping and a high gloss finish. The best-in-state ULAB football team will go from Cubs to Dogs for a cultural crossover moment that will celebrate the movie’s milestone for their game against Mentorship Academy on October 19. The limited edition adidas SCLSU and ‘The Waterboy’ 20th anniversary capsule collection will be available exclusively during a special event at Sneaker Politics consortium in Baton Rouge, LA beginning October 18 and available for a limited time on adidas.com beginning on October 19. For more information, visit http://news.adidas.com/US. Join the conversation on Twitter and Instagram via @adidasFballUS | #teamadidas.